Sweet potatoes are often overlooked as “holiday fare” – something to be enjoyed certain times of the year and forgotten about the rest. But I believe sweet potatoes are a staple we should all be embracing. There is so much to love about these orange guys! They’re inexpensive and incredibly versatile, adapting to almost any type of cuisine. They’re supremely healthy, full of Vitamins A and C, beta carotene, and (best for us) SUPER low in sodium. 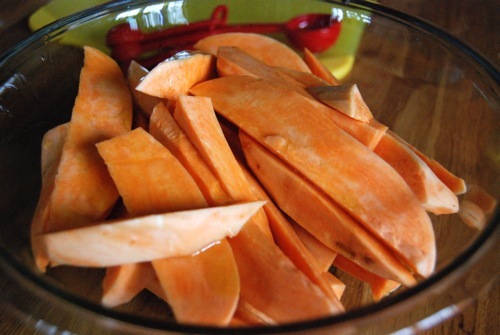 When buying sweet potatoes look for firm, orange flesh, free of soft spots or blemishes. And at home, store them just like potatoes or onions, in a dark cabinet or drawer – NEVER in the fridge! My family & I enjoy sweet potatoes year round, and I created this recipe as a “different” way of eating them that would be simple and appealing to all, even the kids. 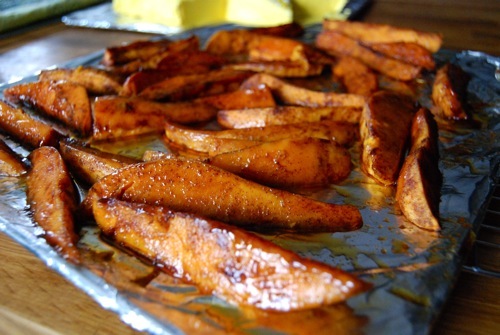 The sweet potatoes are first peeled, then cut lengthwise into spear-like wedges. After a quick toss with some olive oil, they’re coated with a mixture of brown sugar, salt free chili powder and spices, and baked. The resulting spears are sticky sweet, spicy and delicious. I like cooking them until they’re so flaccid, they practically fall apart and melt in your mouth, but if you prefer sturdier spears simply shorten the baking time. 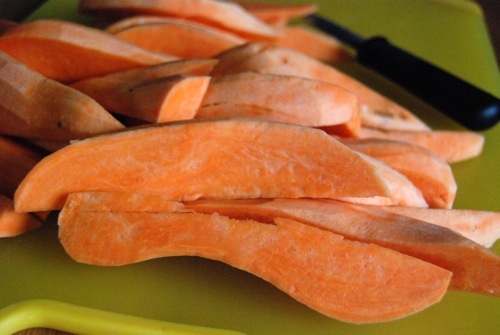 Peel the sweet potatoes and cut in half lengthwise. Cut the halves lengthwise into spear-like wedges. 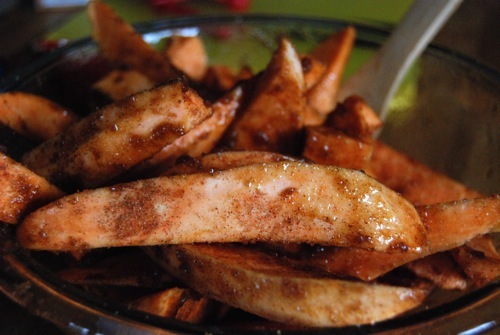 Place the wedges into a large mixing bowl, add the olive oil and toss well to coat. Measure the brown sugar and spices into a small mixing bowl and whisk well to combine. 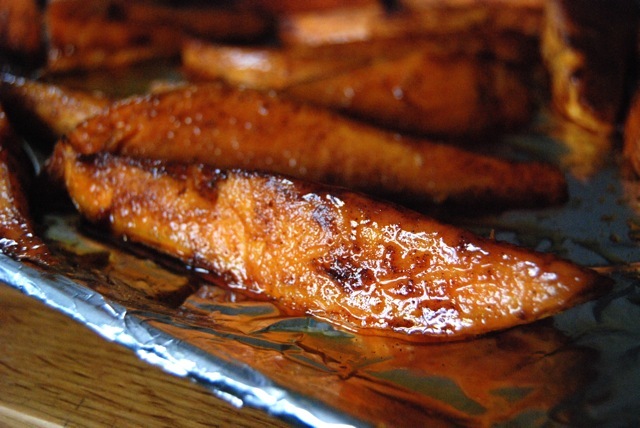 Sprinkle the mixture over the oiled sweet potato wedges and toss to coat. 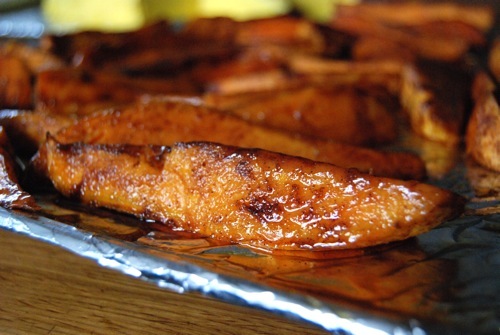 Place the coated sweet potato wedges on the foil-lined baking sheet. Place baking sheet on the middle rack in oven and bake 20 minutes. Turn wedges, then return to oven and bake until soft, 10-20 minutes more, depending upon thickness. These look amazing! I’m going to make them soon! WOnderful to hear, Vira!! Hope you enjoy them – we sure do! Just like our garden sweet potatoes that we’re still eating. We’re trying to be more cautious of our sugar intake, so I don’t know if we should try this recipe … oh heck, why not. If you say it’s good, I’ll take your word for it. We often make it with just olive oil, sprinkled with salt and pepper. And, I cut them into thin french fries, so they bake just a little hard. We’re not fans of mushy, which is why we can’t put the s.p. on the grill anymore. Pretty sure Husband will love your recipe! Katie, these *are* dessert – w/ a little kick. I love them. Inky, those canned yams – I grew up eating them. My mom still makes her sweet potato casserole using them. And they sure make tasty pies. Though I like mine fresh the best. What can I say? Those look sooooo good! I love sweet potatoes or yams. My favorite way USED to be with butter, lots of salt & freshly ground pepper. Now I eliminate the salt. I’ve never been a fan of holiday sweet potato dishes because of all the syrupy goop. But these would be great because of the savory spices combined with the sweet. I will have to make a special trip to the store to pick some sweet potatoes up. I agree with you, they’re a great vegetable. Hope you enjoy it, Shambo! Oh my goodness, these look so delicious and fragrant! I’m a huge sweet potato fan but can rarely convince anyone else in my house to enjoy them, the weirdos. Fine . . . more for me! Hah! That’s the way to look at it Meg! Or… maybe you can make these and see if you can change some minds? Can’t wait to try this, Dishy! PS your photos are looking stellllllllar! HEY SG! Thanks so much!! Really hope you enjoy them. I made your matzoh pie crust this morning – TOO good!! Can’t wait for the cheesecake to finish chilling so I can try that. For reals!